Dress your bed with vintage-look bedding that that evokes quality bed linen of days gone by. These pure cotton quilt covers are designed to become softer and more comfortable with wash and wear; each set is pre-washed and pre-shrunk to ensure their integrity is maintained, which offers additional appeal as they are low-maintenance, non iron, and easy-care for a relaxed look. The quilt cover sets comprise ring spun yarns that are woven into a very soft 100% cotton percale for the loveliest bedroom set-up. Each set includes 1 x quilt cover; Single sets include 1 x standard pillowcase, Double or larger include 2 x standard pillowcases. Canningvale is Australia’s premier Brand in Home textiles – with products for the bathroom, bedroom and beach. 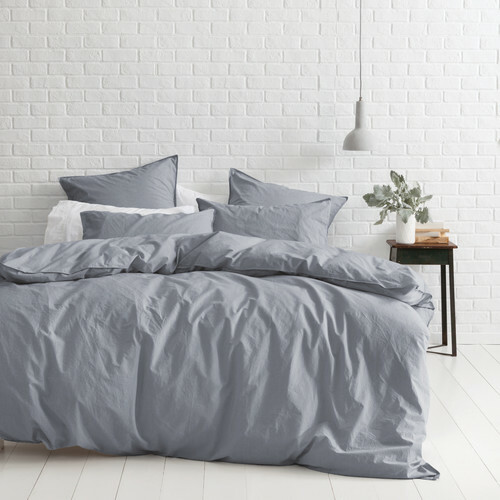 When you buy a Denim Melange Vintage Soft Wash Cotton Quilt Cover Set online from Temple & Webster in Australia, we make it as easy as possible for you to find out when your product will be delivered to your home in Melbourne, Sydney or any major city. You can check on a delivery estimate for the Canningvale Part #: VINT here. If you have any questions about your purchase or any other Quilt Covers product for sale our customer service representatives are available to help.Whether you just want to buy a Denim Melange Vintage Soft Wash Cotton Quilt Cover Set or shop for your entire home, Temple & Webster has a zillion things home. Soft and supple quilt cover! Just adore this quilt cover set. It is so soft and oh so cosy! The colour is wonderful and the cotton is superb quality.